There’s no doubt moving office can be a complicated, stressful and a time-consuming business. The team at Ben Johnson Interiors have worked on many relocations for clients over the years and have seen and resolved all manner of issues on the way. So, we’ve used our experience to compile 10 top tips for your office move in order to minimise stress, keep costs down and ensure your relocation runs as smoothly as possible. Make sure you check your existing lease to check up on your current obligations and liabilities and find out how much notice you need to give. Decide on your preferred location, how much space you require and what your budget per sq ft is. Signing a lease for too much or too little space can cost your business dearly. A workplace consultant or interiors specialist can help you plan accurately for this. Consider the style of the building you have in mind, the length and type of lease required and the facilities you require, for instance manned reception, parking and links to local transport. A detailed budget should then be prepared. Consider the remaining cost of your existing office, including penalties incurred on the lease of your existing office; the rental deposit on the new property; costs of office design, fit out and furniture costs of IT relocation; possible HR costs including redundancy, relocation and recruitment; updating of stationery and marketing material and finally, your new office rates, business rates, service charges, maintenance and insurance. Set a realistic moving date and work backwards from here, remembering to review this with your office interiors specialist. Appoint a project manager for the move if necessary or if you are doing this yourself, create a shared timetable for your move including tasks, actions, timescales and those responsible. Allow time to develop your space plan into an interiors concept. 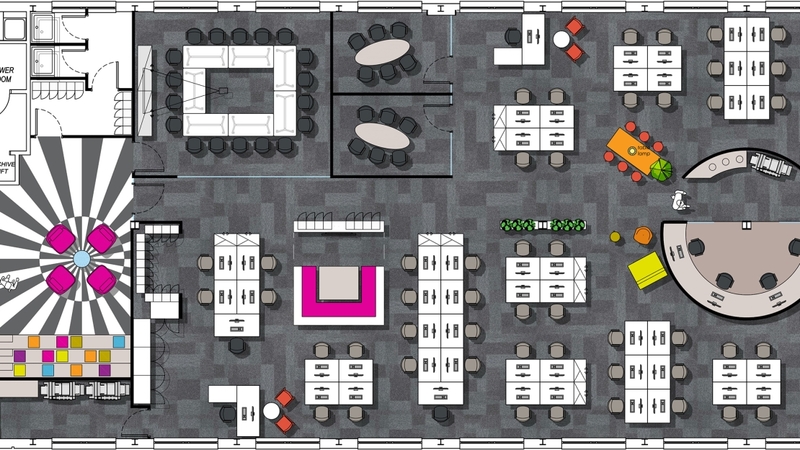 You will have many fit-out elements to consider including partitioning, kitchens, power, data, AV, lighting, air conditioning, flooring, blinds and graphics – all of which will impact the style and cost of your office. Decide what existing office furniture you can re-use and what items you will buy new, or lease. Finally make sure you understand the total fit-out programme. Your chosen fit-out contractor will have a lead-in time and a build time which will vary depending on the amount of work required. Don’t forget you must maintain the connectivity needs of your staff and clients throughout the move process. This is often an issue when moving office and a plan should be put in place as early as possible as lead-times can be lengthy. Make an inventory of all your requirements for telephones, computers and networking. Agree overall requirement of hardware, software, licenses, networks, cabling, power cables, installation and testing and discuss all with IT team. Get recommendations and quotes for removals as prices and quality of service can differ widely. Make copies of floor plans available to the removals company as well as labels for furniture and equipment to match the floor plan. Notify all staff where they will be located and agree on how to work the overlap of the two offices during the move. Make sure the old office is cleaned up and make good any damages. When appropriate, keep external people and clients informed of your move. Notify customers of your change of address and outline the positive reasons for moving. Contact your bank, insurance companies, government agencies and companies house as well as office suppliers and service providers. Inform utility companies well ahead of the move and arrange for redirection of your mail. Turn your office move into a PR opportunity and get some positive publicity in the local press! Make sure you contact your local council to make temporary parking arrangements and to clear entrances during move. Conduct a thorough site inspection of new office and make a test plan to check all equipment, for instance phones, computers, printers and servers. Check for condition of new offices on arrival and take picture as a record. Set up a “lost” and “found” area at each site and make sure staff have access cards and keys. Good luck and Happy New Home!